OK, so I risk becoming the Groupon referral blog, but they have posted their second must-have Groupon of the week. This a $10 for $20 worth of meat. They have an incredible selection of sausage (around 40 kinds according to the Groupon). Kroeger & Son is a great little stand at Findlay Market. Take The Cake uses Kroeger’s loose summer sausage to make their Sausage Gravy and Biscuits. I have had great success making sausage gravy with it at home (now I just need to crack Doug’s biscuits). There is more than one option though. You could almost dedicate an entire Blog to a trying out all their sausage. 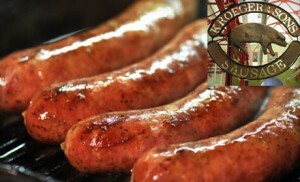 Seriously, if you have not tried Kroeger & Son’s, do it. And this will give you an extra $10 to do it with.